Coffee With Games: Are Wii owners playing the original Metroid? Metroid was originally released on the NES in North America on August 15, 1987. It was released in Japan and in Europe as well. Metroid was re-released on the Wii's Virtual Console in North America on August 13, 2007. It is available for download off the Wii's Shop Channel for 500 Wii Points. 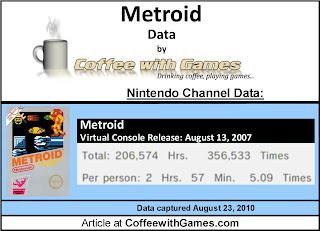 The data pictured below was collected 1,105 days(3 years, 9 days), since Metroid was re-released. 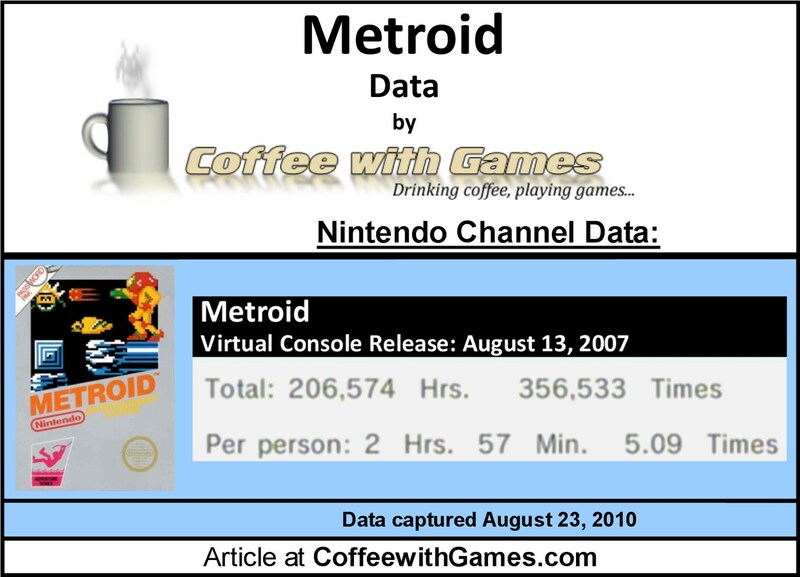 Metroid has 70,045 Wii players reporting their play-time data, on the Nintendo Channel. Nintendo has made approximately $350,225 on Metroid, based off the Nintendo Channel data. I checked at about 4:30PM, on 8-29-10, and Metroid was not listed in the Virtual Console's "Most Popular" games; which displays the Top 20 most popular Virtual Console games. So, are Wii owners playing the original Metroid off the Virtual Console? I would say the data shows most are playing it to completion, though maybe not much more. Have you played Metroid in the last year? If not, how many years has it been? For me, it has been probably 15+ years since I have played it. Does Zero Mission count? If not, then no, I haven't played it in the last year. I couldn't say how many years exactly it's been; I know I attempted to beat the game as it was an unlockable in Metroid Prime 1, and it was definitely after beating Prime, but I couldn't say how long after that I got the urge to tackle it. I found and bought Metroid II for GameBoy and beat that this year though. Lots of fun, just a shame all the "hallways" look the same. I still like the original Metroid, but I haven't played it in a while. Perhaps due to Nintendo adding it to all of their games (Prime, Zero Mission) during the early 2000's, and I played it there. Owning 3 versions of the game was enough for me. Yea, Zero Mission was Metroid on the Game Boy Advance right? I think it was a semi-port/remake of the original; so I would think that counts. I own Metroid Prime 1, but only played it for about 20-30 minutes. I think I'm just going to attempt it in Metroid Prime Trilogy with Wii controls. I have tried to avoid purchasing more Virtual Console games, just because I would rather support the WiiWare titles and those developers; but I may have to end up downloading Super Metroid if I ever go back and play the original again. Thank you all for the comments! Has anybody else played the original Metroid(in any form) recently? I don't know what to say regarding Virtual Console other than how utterly disappointing it's been to watch Nintendo let that whole service fall apart and do nothing to "save" it. I actually bought the Wii with the service in mind. You can imagine how I feel now that Nintendo's stopped caring about it. That said, there are some excellent titles for it, especially on all the random non-Nintendo systems. I want to support the service, but one can't as "Buying games will help to show Nintendo we care". I think they are set in letting the concept die no matter what. Funny part is, outside a few obvious and prominent titles, the VC library has more proven and established hits than the WiiWare's service, as it's not affected by the "modern sensibilities" that hamper a lot of today's games. When all else fails, try a classic. Which reminds me: I had a fairly thriving metropolis in SimCity before my bad luck befell me. I really should get back into that game. On WiiWare: I think WiiWare has some great games though, and I only own a few. As for the Virtual Console, I really wonder if Nintendo is purposely dropping support of it, slowly but surely; because they are prepping for their next system's online service, and know there won't be an easy way to transfer all the games over from a Wii to the new console? Maybe their thinking WiiWare is a different story, because it's more 3rd Party supported, so transferring those games won't matter to Nintendo as much? WiiWare does have a lot of excellent titles. Others you may want to consider: The Strong Bad series, the rest of the Bit.Trip series, Cave Story, And Yet It Moves. Orbient, Castlevania: The Adventure: Rebirth, Mega Man 9, Blaster Master.... I'm looking forward to Retro City Rampage when that hits. I have a feeling when a new system comes out, and the question of "Can you transfer your Wii games or not" comes up, it's going to be a nightmare, and I suspect some gamers are going to throw a fit. "I have a feeling when a new system comes out, and the question of "Can you transfer your Wii games or not" comes up, it's going to be a nightmare, and I suspect some gamers are going to throw a fit." Well, we know it's possible on the Wii right now, but only if Nintendo agrees to it when you call them up and explain the situation. I really wonder if perhaps Nintendo is working on the online portion, but after seeing how they have done so little with the Wii's online, I'm not holding my breath for a smooth transition with the next console.